It shouldn’t be a surprise to most of you that I adore am obsessed with Pierre Hermé’s desserts and pastries. (I actually bought the same cake (different shape and styling) from Paris a few years ago.) I was craving the most indulgent chocolate cake (and I had a few pounds of chocolate in my refrigerator) and thought of baking this cake from his soon-to-be-released book Pastries. 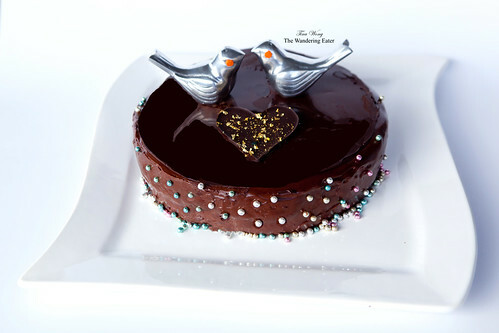 It has a very moist, brownie-like cake as the base, topped with chocolate cream (think pudding-like texture), fluffy chocolate mousse, chocolate glaze, then topped off with a chocolate sheet. In all, it should come as one intense, chocolate-y bite that isn’t sweet and it has a little bit of crispness because of the chocolate sheet. Though I don’t celebrate or really care about Valentine’s Day, it doesn’t mean you can’t indulge yourself (and your significant other in your life) with this sinfully decadent, five-layered chocolate cake. There isn’t much baking in this recipe but there’s a lot of waiting to let the cake cool and set in between layers. Give yourself at least 6 hours total to work on this cake. If you do intend to serve this on Valentine’s Day, I suggest you to start working on it tonight and finish it (glazing and letting it set) the next morning. 1. Preheat a convection oven to 340°F. Butter an 8-inch square (20 cm) (or what I have done, 8-inch diameter ring) mold, 1 1/2 to 2 inches (4 to 5 cm) deep. Dust it with flour. 2. Melt the chopped chocolate in a bowl set over a saucepan of simmering water (also called bain-marie); the bottom of the bowl should not touch the water. 3. Remove from the bain-marie. Add the softened butter into the melted chocolate, along with the sugar, eggs, and sifted flour. 4. Pour the batter into the prepared mold. Place it in the oven and bake for 20 minutes. The cake should look underdone. Unmold the cake on a wire rack and let cool. Clean, rinse, and dry the mold, then wrap it in plastic wrap. Return the cooled cake to the wire rack. 5. In a saucepan, bring the milk and heavy cream to a boil. While heating the milk-cream mixture, in a bowl, beat the egg yolks with the sugar. Once the milk-cream mixture reached boiling temperature, turn off the heat. Combine the two mixtures and pour it back into the saucepan. Stir over gentle heat until the mixture reaches 185°F (85°C). 7. Pour the cream over the cooled cake. Refrigerate for 1 hour, then place it in the freezer for 1 hour. 8. Melt the chopped chocolate in a bain-marie. Remove the bowl from the bain-marie once melted. 9. In a saucepan, bring the milk to a boil. Pour the milk over the chocolate in the bowl, beating until the chocolate is smooth. Add the egg yolk and incorporate well. 11. Incorporate one-third of the beaten egg whites into the chocolate mixture, then carefully fold in the remaining egg whites. 12. Pour the chocolate mousse over the layer of smooth chocolate cream. Smooth the surface with a spatula. Freeze for 2 hours. 13. Melt the chocolate in a bain-marie. Remove once it is melted. Let it cool at room temperature until the chocolate thickens slightly. Reheat it very slightly for a few seconds in the bain-marie, stirring it until it reaches a temperature of 88°F to 90°F (31°C to 32°C). 14. Pour the chocolate over a sheet of acetate sheet on top and spread it out. Before it can set, cut out a square (or circle) the same size as your cake. Place another acetate sheet on top and add a weight to prefer the chocolate sheet warping as it dries. Refrigerate for 2 hours. 16. In a saucepan, bring the cream to a boil, then remove it from the heat. Gradually beat in the chopped chocolate, beating it from the center outward. 17. Set aside to cool to 140°F (60°F) before adding the butter, then add the reserved chocolate sauce. 18. Remove the cake from the mold and discard the plastic wrap. 19. Using a small ladle, pour the chocolate glaze (it should be warm, between 95°F and 105°F [35°C to 40°C]) around the sides of the cake, then over the center. Using a cake (or offset) spatula, evenly coat the sides and edges. Leave to set for a few minutes then transfer it to a cake plate. 20. 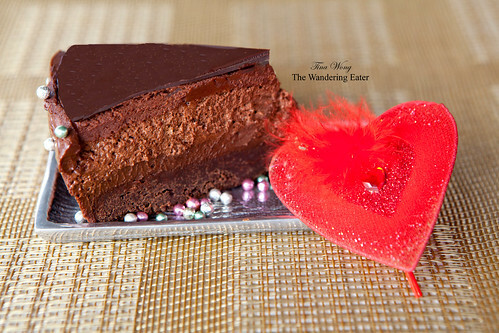 Remove the acetate sheet from the thin chocolate sheet, and place it on the cake. Set the cake in the refrigerator to defrost for 2 hours before eating. Serving tip: When you do want to serve the cake, it’s best to have a tall container filled with hot water and a sharp chef’s knife set in it for at least 30 seconds. Wipe the knife dry and start cutting the cake so it would have clean cut. 1. It is not really necessary to use Valrhona chocolate. Hermé (and most pastry chefs I know and spoke to) is loyal to this chocolate brand. Just make sure you are using 72% cacao chocolate or the resulting cake would be too sweet or too acidic/bitter. 2. Regular granulated sugar is fine. Superfine sugar is preferred because it dissolves more quickly. 3. Did I mention this is not a diet dessert? Do use whole milk because the resulting texture would change drastically without the milk fat in whole milk. 4. Using an immersion blender is not necessary if you started with a stand mixer (when you beat your egg yolks and sugar). You just keep whipping it fitted with a wire whisk (speed set at #6 on a KitchenAid mixer) until the mixture is smooth. 5. There will be leftover chocolate sauce (after you use the reserved amount for the chocolate glaze) that you may serve with your cake on the side. Thank you, Giulia! I know you have the skills to make this cake. It just takes a lot of time to make it. Thanks! It was indeed a heavenly cake.